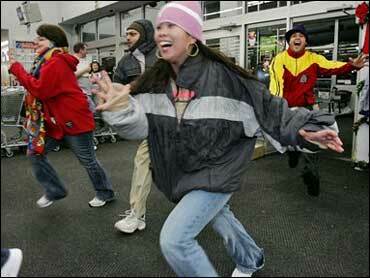 Remember those pictures of people stampeding into the stores as dawn broke the day after Thanksgiving? According to new research, people who really enjoy shopping may be experiencing a shopper's high, just like a runner's high. During a shopping experience, the human brain apparently releases the chemical dopamine, a kind of natural messenger which is essential to the normal functioning of the brain, and which has a role in our ability to experience pleasure or pain. It appears also to have a role in addictive behavior. Simply put, if an action makes us feel good we want to repeat it. "You're getting a release of a chemical in the brain which is associated with learning, with making new memories, and with learning behaviors and how to repeat them," explains David Sulzer, an associate professor at Columbia University Medical Center who studies the functioning of the brain. British researchers have been monitoring shoppers electronically, and have recorded a marked difference in brain patterns between shoppers who are just browsing and shoppers who are about to buy. Of course, that's not news to avid shoppers. "When you're feeling bad, and you buy something good, and you look good, you feel better," says one shopper. Not everyone is vulnerable to the shopper's high. One man said he finds shopping affects him "more like turkey. You know how turkey gets you a little tired and you want to go home and go to sleep? That's how I get." Try not to make any impulse purchases while you're experiencing that "shopper's high" because it may be affecting your decision-making. Use cash or a debit card instead of a credit card to avoid binge shopping. Window shop after stores close for the day. Avoid shopping trips while visiting relatives and friends during the holiday season. Just the sight of all that new stuff can trigger the chemical release.